Octave Finley, 78, was honored Wednesday at the 109th annual Arlee Celebration for 39 years of sobriety. Finley received a black leather vest with an embroidered back that read “Sober Indian Riders,” and a lifetime membership to the group. The Sober Indian Riders, made up of about 20 American Indian bikers, promote health as they ride throughout the Flathead Reservation making public appearances and talking to the community. 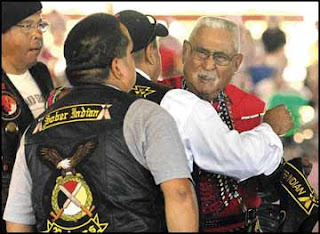 Bikers accompanied Finley into the powwow arena as a rhythmic honor song reverberated in the air. Finley is a spiritual leader and a war dance chief who leads the powwow grand entries. He served in the U.S. Army and Air Force during the Korean and Vietnam wars, and said he had a drink in his hand just about every minute of the day, starting at age 14. “I didn't even know he was drunk until I saw him sober,” said Edna, Finley's wife of 46 years. “He was drinking when I first met him.” But after many years of alcoholism, Finley said he was done with it. “I stopped for them,” he said of his wife and four children. But Finley's recovery is not all he's known for on the reservation.